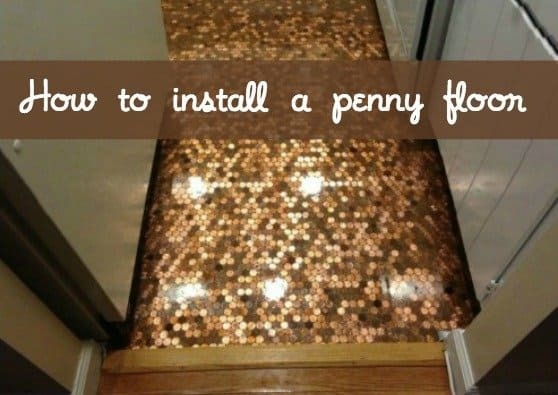 Have you been thinking of installing a DIY penny floor? 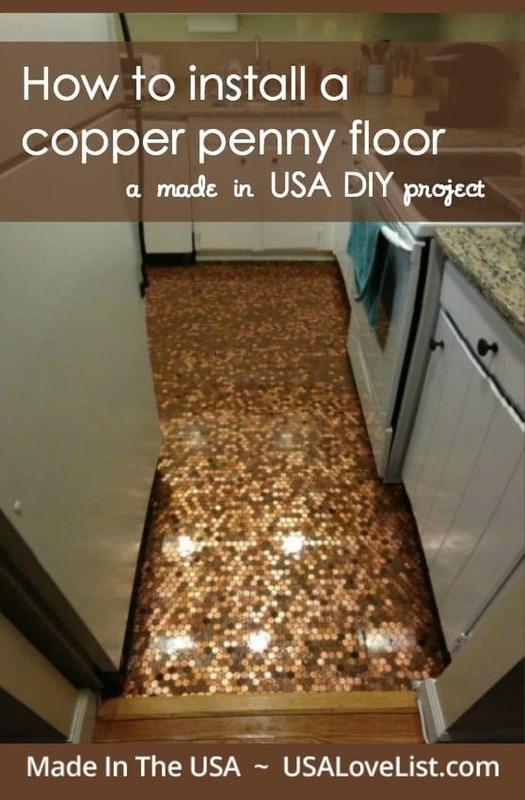 If you're looking to put money into a room you literally can do so by using pennies and epoxy. I'll tell and show you exactly how I did it, step by step. I recently bought a home and have been on a DIY kick. 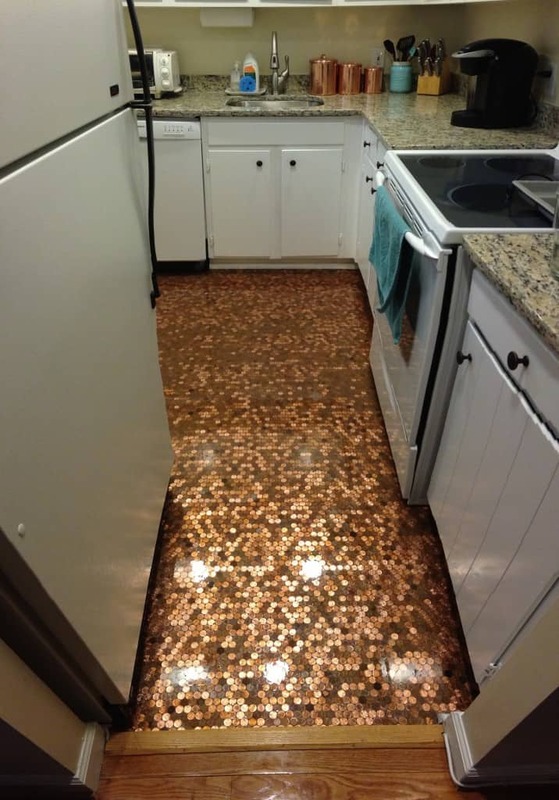 When I was out with my relator and found “the one”, I looked at the kitchen and instantly decided a penny floor would light up the room. I'd seen a penny floor at the restaurant Lincoln in Washington, DC and other penny projects all over Pinterest, but didn't have any idea what I was getting myself into. 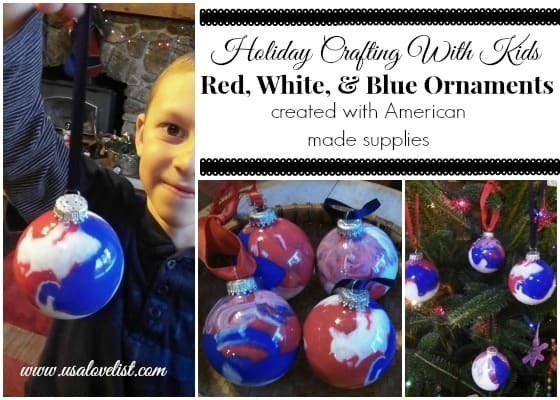 Obviously pennies are Made in USA and all of my supplies were as well, so it was a great Made in USA DIY project. Here's a step by step explanation of the process my dad and I went through to install a copper penny floor. I decided to do my kitchen because the floor is only 38 square feet. 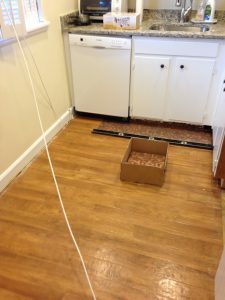 Although it seemed like a small space and not too big of a project, by the time we started laying about $2.78 worth of pennies per square foot the space started to feel much bigger. I laid the pennies very close and tight together so it ended up being 278 pennies per square foot. Therefore, I needed 10,564 pennies and some change. I started by asking friends to use me as their Coinstar and raided my nephews' piggy banks, but ended up having to visit multiple banks. 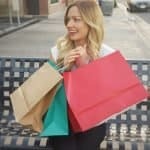 Banks would offer anywhere from about $10-$40 in pennies depending on what they had available. Note: take a reusable grocery bag with you to carry the pennies out of the bank. I decided to not clean the pennies because when you're working with over 10K, as my dad reminded me multiple times, “you'll drive yourself nuts.” Plus it's very hard to get a penny super clean and shiny. Purchase a 12×12 inch picture frame or, if you're handy, make one. You'll pour the pennies onto the frame and line them all up exactly how you want them. I decided to let them fall as they were and I got an organic pattern. I wish I would have mixed up the rolls of pennies from all the different banks because there are some areas that have similar colors and shines to them, but when working with that many pennies you just have to go with it. Take a piece of contact paper and apply it to the sheet. Press the contact paper firmly onto the pennies so they adhere to the paper. Get a sturdy box and start putting your 1 square foot “penny tiles” into the box. The floor I decided to refinish had brown linoleum and was very level, so I didn't have to do anything to my floor other than clean it. If your floor isn't level or you don't like the floor color (which will slightly show through the small gaps in the penny lineup) you'll want to change it. Since it was the kitchen, we moved the oven and refrigerator out of the room. We didn't put pennies under the oven space since copper conducts heat, but we wanted to make sure we got it right along the edge. We also temporarily removed the baseboard molding so once completed the edges would look perfect. I even had people ask me if we cut pennies because of how precise it looked once we put the molding back. 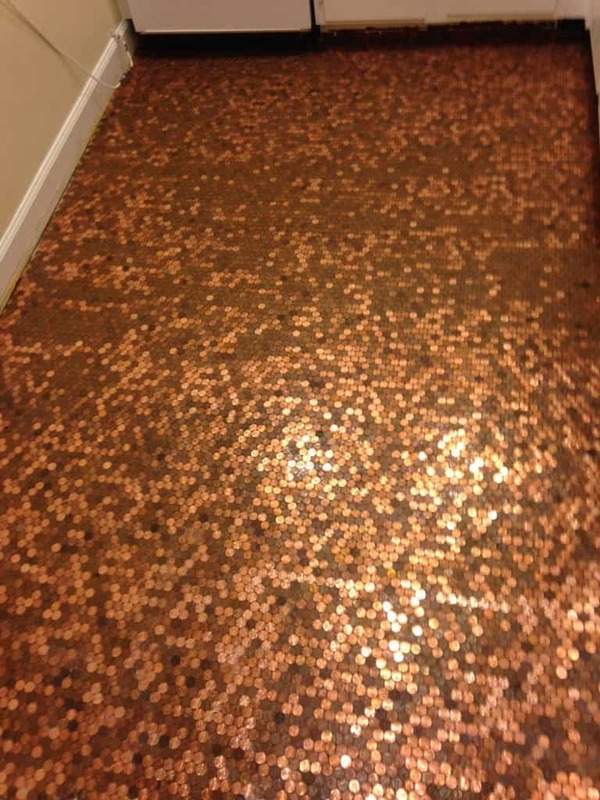 I used Krylon Low Odor Spray Glue (Made in the USA) to adhere the pennies to the floor. 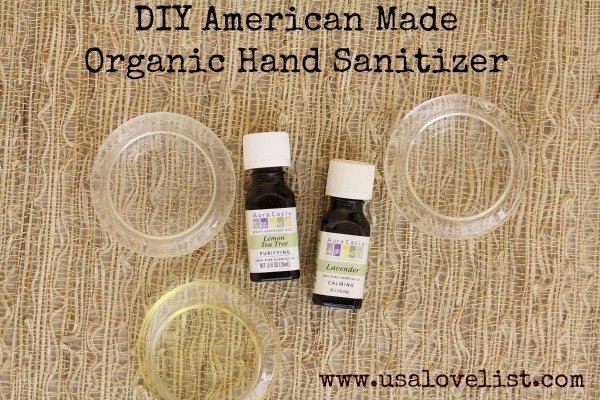 However, I'd recommend using good old fashioned Elmer's Glue (also Made in the USA). This glue adheres to both plastic and metal, so it seemed like the perfect choice, but we ran into some difficulties once we started to lay the pre-made penny tiles. We sprayed a section of the floor and waited the recommended time before moving a tile onto the glue and then we'd wait some more. However, because there wasn't enough air getting to the glue and pennies due to the contact paper when we started to pull up the contact paper the pennies started to come with it. Thus, we had to take a straight edge ruler and secure the pennies and pull the contact paper up row by row. It was a bit tedious. 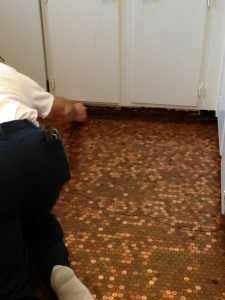 We had only made 29 tiles and had about 38 square feet, so after laying and gluing all the tiles down we started using Elmer's glue and placed each penny on the floor. The trick is not to use too much glue. Elmer's claims to dry clear, but it is a bit cloudy still once it dries and you can see EVERYTHING once the epoxy is laid. 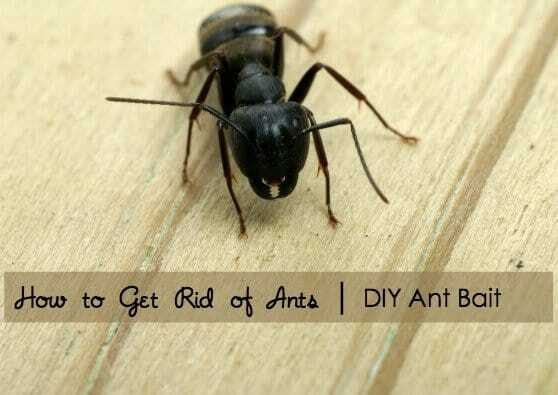 So don't use too much glue because you'll see the excess. If we were to do it all over again and had timed our project differently, we would have skipped making the penny tiles with contact paper and extended the gluing step over several days. 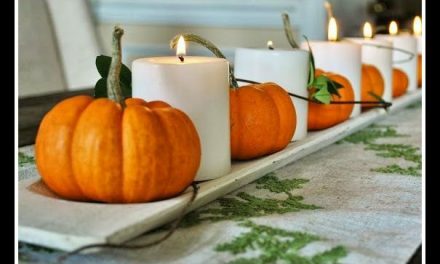 You could invite friends over, pop open a bottle of wine, turn up some music and have a gluing party. It would be the best way to secure the pennies to the floor. This step took us about 8 1/2 hours. We let the glue dry overnight and were ready to pour the epoxy the next day. To seal the floor, you use clear epoxy. This step will make or break your project. 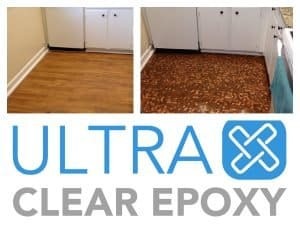 I did A LOT of research as to which brand to use and I'm very happy I chose commercial-grade Ultra Clear Epoxy from Best Bar Top Epoxy which is Made in the USA. It is UV resistant so it is less likely to yellow over time. It is glossy and self-levels at 1/8″ which is twice as much as your standard epoxy. Go to their website for preparation information and the chart to figure out how much you'll need. I ordered 3 gallons for my 38 square foot floor. I also got the Epoxy Tool Kit which was very helpful. Step by Step instructions come with your order and it is very important to read them a few times over and follow them precisely. This step took us about one and a half hours from prep to clean up. The room must be at 75 degrees or more. My dad is super clever, so we used a space heater and a sheet hung over the doorway to trap in the heat. Otherwise, we would have been sweating and running up the electric bill for 3+ days. 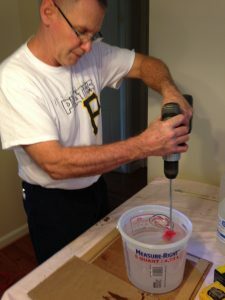 We also placed the epoxy in the room with the heater overnight so it was warm when we were ready to start mixing it. Get a blow torch or very a hot blow dryer to remove air bubbles. You have up to 20 minutes after you pour to apply heat to remove/pull up the air bubbles. Use the full 20 minutes because bubbles will keep appearing. Mark your space so you know what area to pour each gallon. I had 3 gallons to pour so we marked it in thirds. Use new buckets and stir sticks with each gallon you mix in order to keep the two parts as equal as possible. Step 7: Wait Until it Dries and Cures… and ENJOY! After 72 hours the floor will be 99% cured and ready for you to walk on. I'd avoid putting heavy objects on the floor if you can. Keep the room at 75 degrees while it is drying. I decided to do this three days before New Years and I was hosting a NYE party so I only had about 60 hours of drying time before I moved the oven and refrigerator back into the kitchen and it was fine. It survived high heels and about 25 people, but it was a risky move. I'd suggest giving it the proper time to dry and cure. 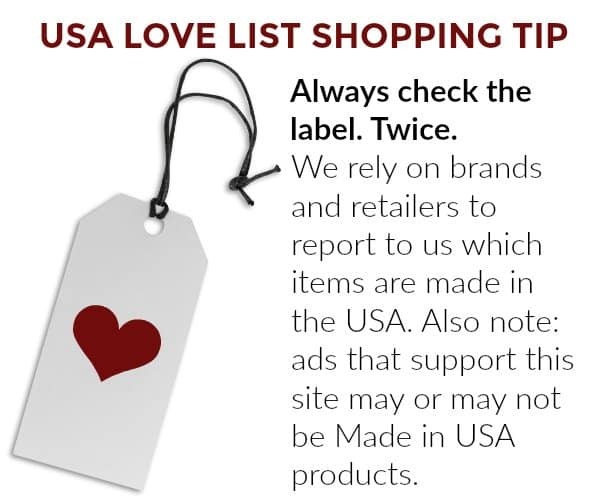 Don't miss our source guide for tools made in the USA. 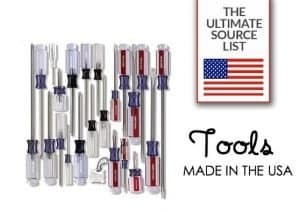 Have you seen our Ultimate Source List for Tools Made in the USA? 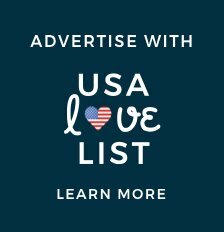 Disclosure: USA Love List received a discount on the epoxy used in this post. 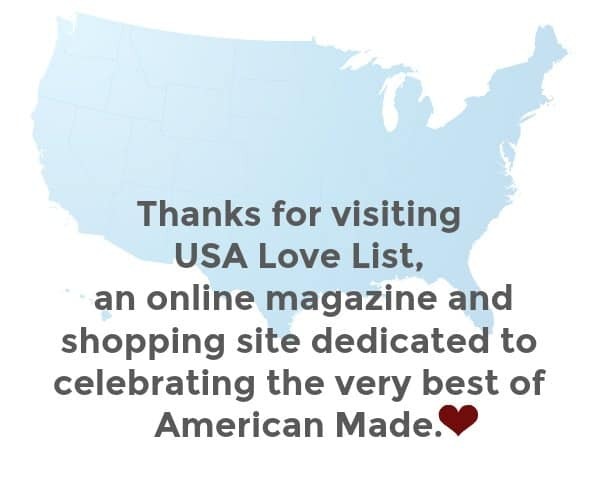 Our opinions are always our own, and we aim to write fair and balanced reviews to promote only the very best of American-made. that is a cute idea, I could see it esp for a rec room, or home office. I like the wood floor from the before, too! Thanks, Rosie! If you ever tackle a project like this be sure to share it with us! Looks great! I want to try it. Is it slippery? It looks shiny and slippery which could be a problem with water. Loved hearing what you would do differently next time! That makes it so much easier for anyone else trying it. How do u apply epoxy in sections? so did you pour one gallon, torch out the bubbles for 20 minutes and then pour the next? essentially doing the floor in sections instead of at one time? can you see the joins from the different pours? Did you end up seeing the individual 1gal pour sections? Does the floor scratch easy? Thinking of doing our “music” room with a treble clef or music notes with bright pennies and dark pennies over reminder. I don’t see the directions for doing this on/as a backsplash? Help please on DIY directions. Applying this technique to the “toe kick” should be possible. But I see problems with the corners without cutting some penny’s to cover the kick. I have directions for backsplash, just have to pull out my to do book. Will try and find it and post it today. I’m gonna guess one would use a paint brush …..
My first thought was, “That would take forever!! !” But, you know, I do love the finished look! Beautiful. 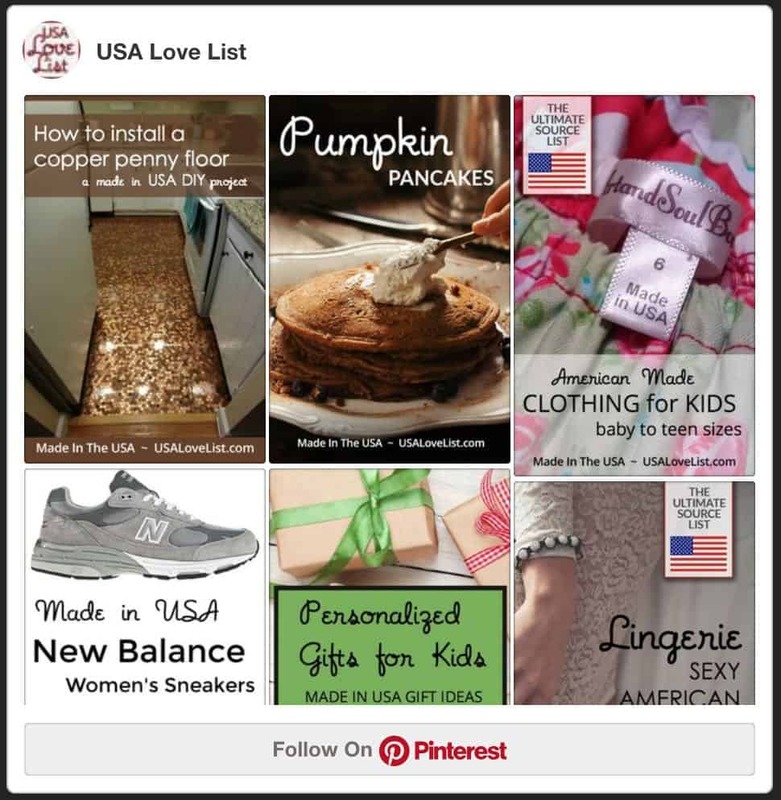 As soon as I saw this, I started noticing tons of other copper penny ideas on Pinterest. SO cute! Very cute! You’re brave for tackling such a project. Thanks for sharing your tips! Thanks for the detailed instructions, links, and follow up to questions. We are doing our 40 square foot bathroom. Based on your advice I scrapped the contact paper “tile” idea and will start laying pennies individually. Since we are in Seattle we are going to also include a an old Seattle world’s fair dollar coin in the floor, an old NYC public restroom token, and some Chinese and Kenyan coins from our travels. We thought about a border using the 50 state commemorative quarters but the size of the quarter leaves a big gap when mixed in with the pennies. BTW- Metal shears work great for cutting pennies in half! We are currently in the process of preparing to do this floor. And I’m wondering, how (or with what) do you clean the penny floor, now that it is installed? Also, how long has it been since you installed your floor and how it is standing up? Have you experience any yellowing or any other issue – after installation? Thanks for sharing your process and being a resource to fellow DYI-ers. This is one of the coolest floors I have ever seen. Love! I think it is wrong to put our great AMERICAN LEADER ON THE FLOOR….AND ISN’T ILLEGAL TO USE US CURRENCY THIS WAY??? According to the US Mint, if the currency can be is not defaced beyond using, it is legal to lay coins as tile. For example, it would be considered a federal offense if I were to wall paper my room with US dollar bills because there would be very little possibility that the bills could be reused; however, coins could be pulled up from this type of tiling with minimal, if any, damage due to their metallic durability, and therefore can be used again as US currency. Ahahahaha I was waiting for someone like you to say this. I think its a beautiful way to commemorate a great leader- so much so that Im filling a 90sqf space with Lincoln’s face. You mentioned about not putting heavy objects on the finished floor. Is that just for the first 72 hours? I want to do my garage and I have a few VERY heavy toolboxes on wheels. I don’t mind waiting a full week to move stuff but, I am hoping that the weight of the toolboxes on the floor will not screw anything up. For all hard work you put in, it looks awesome. Bet it looks even better in person, than in photos. What a unique idea…never heard of it before…so cool! This would make an amazing bar top! There is a Bar with old coins in the Bartop, in Independence, Oregon. I believe the address is 101 Polk st. I bartended there for about 5 years! What an awesome floor. I have a Galley kitchen with tile,would I need to remove the tile first. 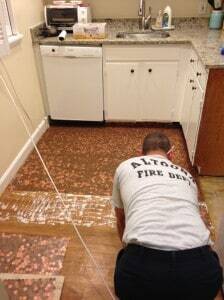 We’re planning to do a penny floor in our laundry room…how in the world were you able to blowtorch air bubbles?? And by that I mean, how were you able to reach everything without actually being on the floor?? Hi! You have to pour the epoxy in sections. Be sure to work from the back of the room forward. Right after you pour your first section you have 20 minutes to work with until you need to pour the next section so take that 20 mins and use the blow torch to get the air bubbles out. Good luck!! Re: Pouring the epoxy? Did you put a barrier of any kind between the sections? If not, what kept the first section from moving into the second area? If you *did* use a barrier, what did you use & how did you eliminate the joint line? We didn’t use any barriers. If you keep the timing correct the epoxy meets the previous section and because it takes a long time to cure, there it blends together with no joint line. Wow, this must have taken forever! I love the result, though. Good job! Hello this was nice!! how is the floor holding up? any yellowing or loose pennies? lol how do you clean the floor? It’s so bold and shiny I think it would look better as a backsplash . i love the way this looks! every penny has its own look so no 2 floors would look the same. Great idea! I’ve seen this online & it looks so cool! I wondered about the easiest way to do it. 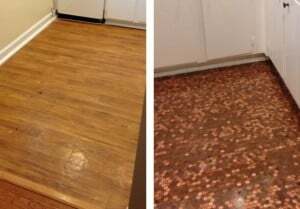 I even wondered about first gluing them to a nice floor tile & then putting the tiles down–but what if the pennies didn’t fit just right, lol. Thanks for the tips! Alexis, how did you or what did you use as a border to keep the epoxy from sealing against the cabinets? We took off the baseboard molding and then re-installed it once the floor was done. Where we took out the oven the epoxy really evenly spreads and just stops. You don’t need to have barriers. Unfortunately this Penny floor will scratch terribly and will not stay in the condition as when it is first done. I’d like to see these floors after a few months of wear. It’s been two years since I did this project and so far it has held up great. No scratches and still just as shiny. I’m sure it probably has a lot to do with the type of epoxy you use. I have been laying pennies for a few days now. I decided to lay the pennies with the Queen facing the same way so that the special ones of my loved ones birth years are different, that and my partner thinks I’m crazy hehe. I had to self level the floor as it was uneven but so far so good. I have put down approx £80 worth and it so beautiful, there’s even a one cent coin there 🙂 We are moving onto the epoxy after grouting but I’m struggling to find a cheap one sadly. 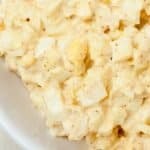 I found your article for tips on laying it. I would love to know, did you use a barrier at all for each section? I’m nervous as I don’t want to ruin them by getting it wrong. Awesome! We did not use barriers. Each section will go as far as it can and completely self levels. It is cool to see how it will just stop! Awesome work. I also stumbled upon more detailed step by step working of Tanya Tooners who made the same type of penny floor on this page (http://geeksnation.org/penny-floor/). Both works are just great. Your’s is adorable! Great product for this at http://www.cointiles.com... also have foreign coin products for that extra special look! what is your subfloor? Can I tile the coins right over laminate flooring? Fantastic Job, came out amazing! I’m near the stage of sealing with epoxy and saw you used 3 gallons for 38 SF. I have 30 SF. The chart looks like you would need twice that amount to seal your floor. Am I missing something? I would love to do a floor like this. A friend owns a bar and his came like it, it is so cool looking! Would spray epoxy work on this? If you needed to get under the floor for whatever reason would you have to cut into your floor? My sister suggested making penny tiles like you did but set them in the Epoxy first (so like normal titles rather than putting epoxy onto the floor….hope that makes sense?…). In your opinion how difficult would that be to do? Why does the room have to be a certain temperature? I’m looking at doing one of these on an outside step but I don’t know how I can get it to that temperature. I can’t see anything on the Epoxy website about having it at a certain temperature. Is that an essential part of the process? Should this work on ceramic tile. What an innovative use for pennies. Looks like it would last a long time too! 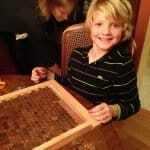 How many pennies does it take to do a 12X12 or square foot? 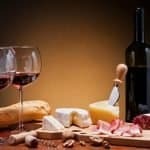 Really nice article. Done many diys using epoxy but this one is new for me. Very creative. We have a penny floor in the family business, Joe’s Pizza & Pasta. We love it! Customers love it! How do deep clean and maintain epoxy sealer? Noticed some dark spots in places.